Today was the sixth operations session on the Welztalbahn. Since I had new equipment in service since the last time, I rewrote the schedule from scratch. I started out with a line-based diagram of where each train is at any point in time. You can see it in my notebook in the photo on the right. Since I created merely a sequence schedule, I didn't need to pay much attention to the speed of trains, and could instead focus on interesting meets. The diagram style format makes it very easy to see when a staging track is too full to hold the trains intended for it. 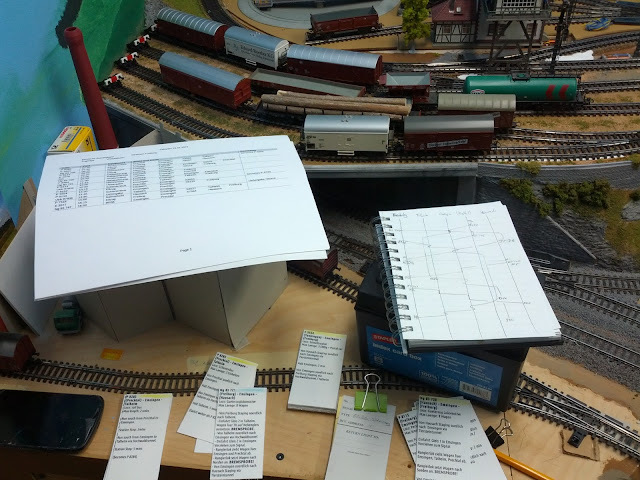 Then I combined this with the existing train cards from previous sessions, assigned train numbers, printed a couple new cards for the added runs, and created the actual schedule used by the operators. A printout is on the left in the photo. Once I had the schedule, it was time to stage the trains accordingly. For the passenger trains this goes really fast. 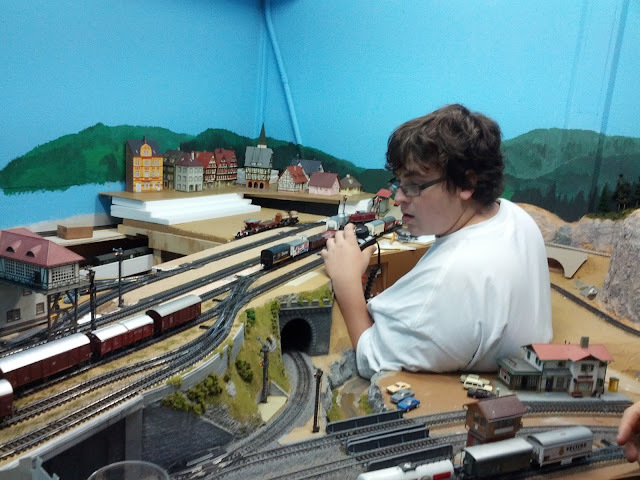 Select the locomotive, move the train into the right place. Done. 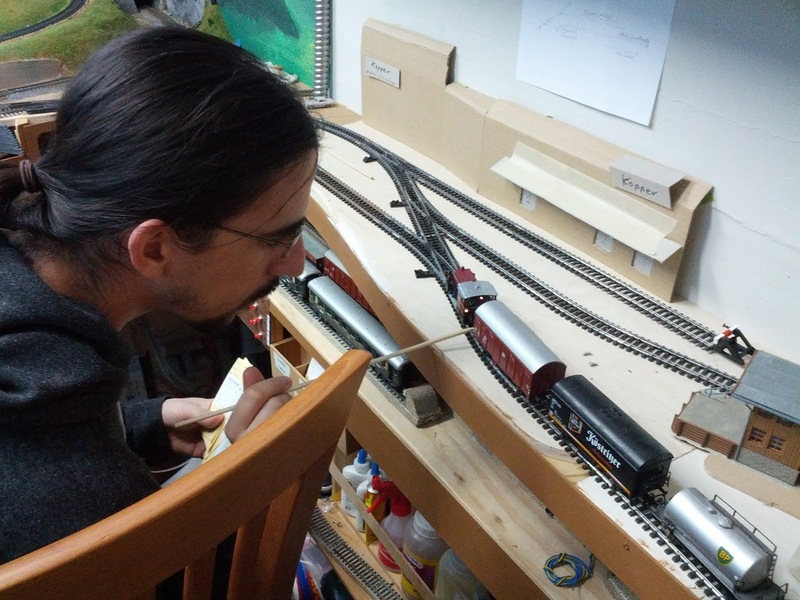 The freight trains tend to need a little bit more attention, but get done pretty quickly, too. All ready to go. Oh, wait, I do need to add a feeder to the Gregorius track in Talheim. It had no power since the turnout surgery last year. That got done quickly, too. Some track cleaning, and ... The PSX circuit breakers indicate a short? Oh man, did I really not pay attention? Disconnect the track. Short remains. Disassemble all of Kopper Sidings. Short remains. Disconnect track from the PSX. Short indicator remains on (!) ... Deeep breath. ... Power-cycle the layout. ... WTF? Now all THREE PSX circuit breakers indicate a short!!! Why now? I have two hours until my operators show up, and I have a short in the layout? But where? ... Deeeeep breath. ... This doesn't make any sense. I didn't change anything, and there's a short? Even with disconnected track? .... Hmmm, bad command station? Overvoltage? ... Replaced the Intellibox transformer (yes, I had a spare 16V AC transformer). Turned the layout back on, and ... no dice. No PSX delivers power to the layout. I connect track power of one block directly to the Intellibox. No problems running a train. I reset one of the PSXs to factory default. Didn't help... Some time later Balazs showed up, we look at the problem, and just as mysteriously as it showed up, the "short" disappeared. I still have no idea what this was. I have an email out to DCC Specialties, maybe they've seen this before. Anyways, a little while later the operations sessions was in full swing. As for the Kopper sidings, the new track at Gregorius worked as well. This session ran for 2.5 hours and all 17 scheduled trains ran with no problems. I think that's a first. 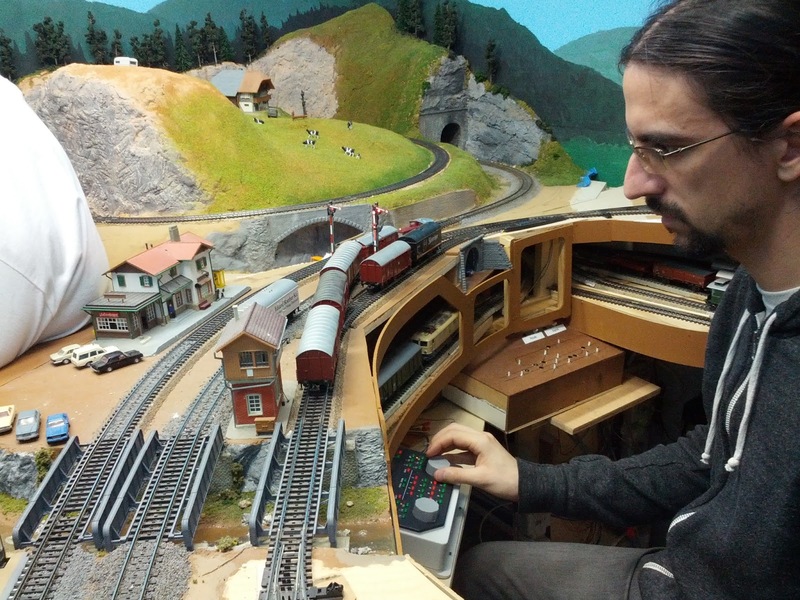 One good question I got today was, "do you operate your layout only twice a year?" -- No. I operate more often than that just by myself. However, I don't count my one-man shows as an operating session, since I usually run with a simplified schedule that includes only certain freight trains.